Over the last day, Russia-backed militants delivered 52 attacks on Ukrainian troops’ positions, 49 of which were precision attacks. “Militants used heavy artillery and mortars, they fired a total of 25 shots from 152-mm cannons, 30 shots from 122-mm artillery as well as 20 rounds from 82-mm and 120-mm mortars. Ukrainian troops were compelled to return fire in 20 cases, reported Ministry of Defense spokesman Colonel Dmytro Hutsulyak at a press briefing at Ukraine Crisis Media Center. In Luhansk sector, Russian proxies opened fire nine times. They used grenade launchers, heavy machine guns and small arms in Luhanske, Krymske, Stanytsia Luhanska, Zaitseve, and Novoluhanske areas. Militants made five attacks near Zaitseve. 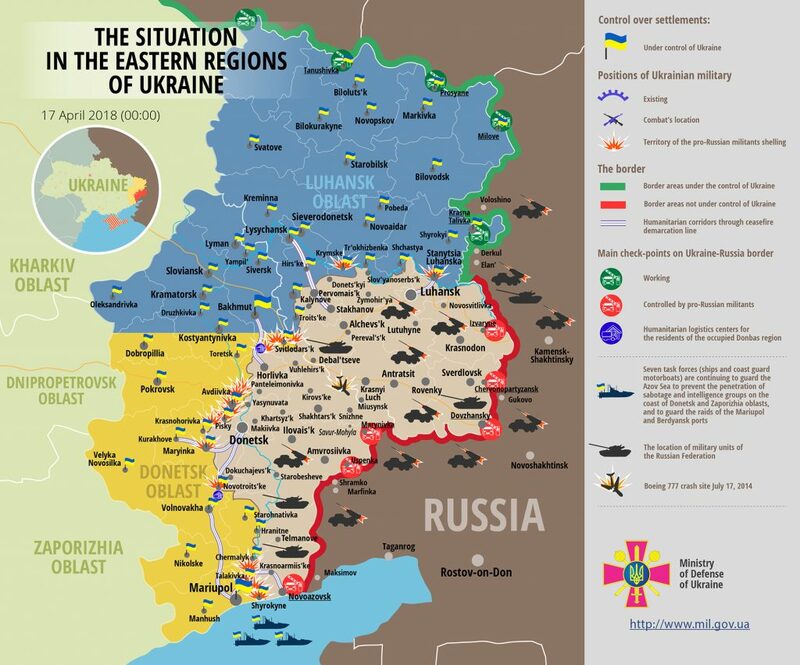 “At about 20:00, Russia-backed militants fired seven 82-mm mortar rounds. They made 30 shots from 122-mm artillery starting about 21:30, the attack lasted for 20 minutes. Later, in course of the attack that started at 22:40, Ukrainian troops recorded 25 incoming shots from 152-mm artillery,” the Ministry of Defense spokesperson elaborated. Militants’ heavy machine gun fire outside Stanytsia Luhanska once again disrupted the disengagement planned for the area. In Donetsk sector, 43 hostile attacks were recorded yesterday. Russia-backed militants shelled Ukrainian troops’ positions in Pisky area four times using 82-mm and 120-mm mortars. Moreover, the enemy used grenade launchers, heavy machine guns, and small arms in Avdiivka, Vodiane, Mariinka, Shyrokyne, Novotroitske, Verkhniotoretske, Lebedynske, Pisky, Talakivka, Hnutove, Pishchevyk, Pavlopil, Kamianka, Opytne, Nevelske, and Shakhta Butovka areas. “Russian proxies used APC mounted weapons in the two attacks near Vodiane, as well as employed IFVs in the attacks outside Pisky, Hnutove, and Talakivka. In addition, hostile sniper fire was recorded in Shyrokyne area,” Colonel Hutsulyak added. Unfortunately, one Ukrainian serviceman was killed in action, three were wounded in action, and two more troops were injured. Report on the military developments as of April 16 is available here. Interactive data on the shelling: chronology shelling chart and the interactive map.